The precise definition of viscosity is based on laminar, or nonturbulent, flow. Before we can define viscosity, then, we need to define laminar flow and turbulent flow. [link] shows both types of flow. Laminar flow is characterized by the smooth flow of the fluid in layers that do not mix. Turbulent flow, or turbulence, is characterized by eddies and swirls that mix layers of fluid together. [link] shows schematically how laminar and turbulent flow differ. Layers flow without mixing when flow is laminar. When there is turbulence, the layers mix, and there are significant velocities in directions other than the overall direction of flow. The lines that are shown in many illustrations are the paths followed by small volumes of fluids. These are called streamlines. Streamlines are smooth and continuous when flow is laminar, but break up and mix when flow is turbulent. Turbulence has two main causes. First, any obstruction or sharp corner, such as in a faucet, creates turbulence by imparting velocities perpendicular to the flow. Second, high speeds cause turbulence. The drag both between adjacent layers of fluid and between the fluid and its surroundings forms swirls and eddies, if the speed is great enough. We shall concentrate on laminar flow for the remainder of this section, leaving certain aspects of turbulence for later sections. [link] shows how viscosity is measured for a fluid. Two parallel plates have the specific fluid between them. The bottom plate is held fixed, while the top plate is moved to the right, dragging fluid with it. 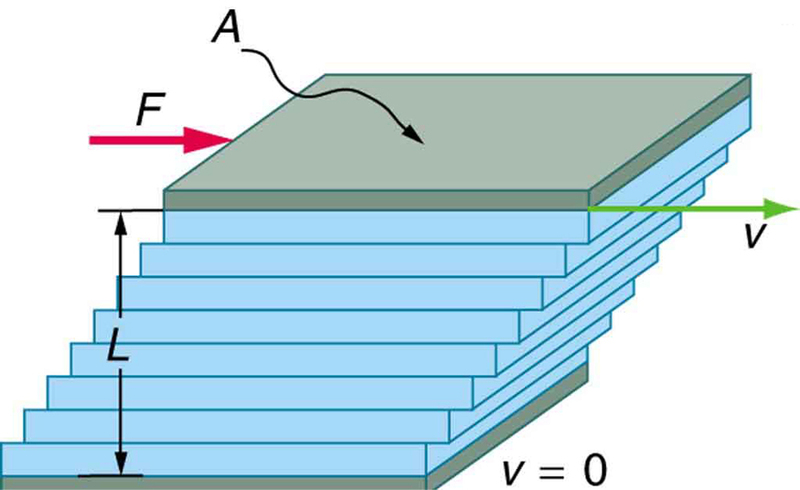 The layer (or lamina) of fluid in contact with either plate does not move relative to the plate, and so the top layer moves at while the bottom layer remains at rest. Each successive layer from the top down exerts a force on the one below it, trying to drag it along, producing a continuous variation in speed from to 0 as shown. Care is taken to insure that the flow is laminar; that is, the layers do not mix. The motion in [link] is like a continuous shearing motion. Fluids have zero shear strength, but the rate at which they are sheared is related to the same geometrical factors and as is shear deformation for solids. The graphic shows laminar flow of fluid between two plates of area . The bottom plate is fixed. When the top plate is pushed to the right, it drags the fluid along with it. which defines viscosity in terms of how it is measured. The SI unit of viscosity is . [link] lists the coefficients of viscosity for various fluids. where and are the pressures at two points, such as at either end of a tube, and is the resistance to flow. The resistance includes everything, except pressure, that affects flow rate. For example, is greater for a long tube than for a short one. The greater the viscosity of a fluid, the greater the value of . Turbulence greatly increases , whereas increasing the diameter of a tube decreases . If viscosity is zero, the fluid is frictionless and the resistance to flow is also zero. Comparing frictionless flow in a tube to viscous flow, as in [link], we see that for a viscous fluid, speed is greatest at midstream because of drag at the boundaries. 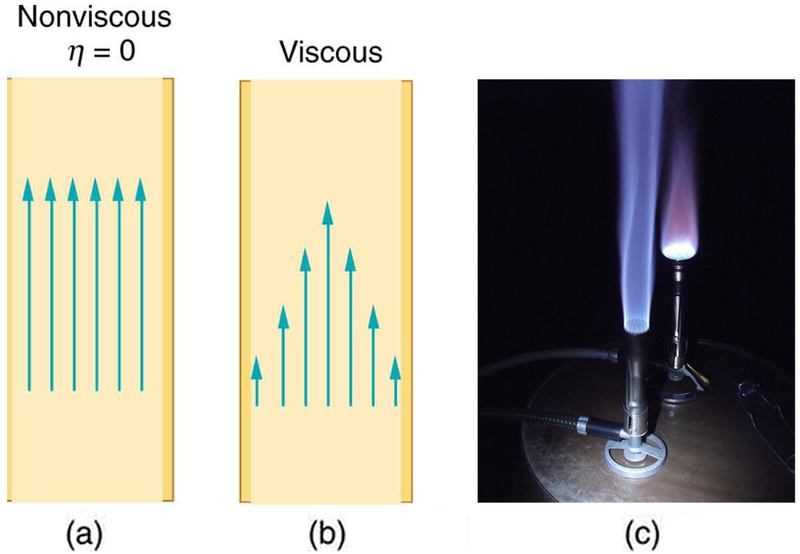 We can see the effect of viscosity in a Bunsen burner flame, even though the viscosity of natural gas is small. Let us examine Poiseuille’s expression for to see if it makes good intuitive sense. We see that resistance is directly proportional to both fluid viscosity and the length of a tube. After all, both of these directly affect the amount of friction encountered—the greater either is, the greater the resistance and the smaller the flow. The radius of a tube affects the resistance, which again makes sense, because the greater the radius, the greater the flow (all other factors remaining the same). But it is surprising that is raised to the fourth power in Poiseuille’s law. This exponent means that any change in the radius of a tube has a very large effect on resistance. For example, doubling the radius of a tube decreases resistance by a factor of . So, given that , we find that . Therefore, , a decrease in the artery radius of 16%. Poiseuille’s law applies to laminar flow of an incompressible fluid of viscosity through a tube of length and radius . The direction of flow is from greater to lower pressure. Flow rate is directly proportional to the pressure difference , and inversely proportional to the length of the tube and viscosity of the fluid. Flow rate increases with , the fourth power of the radius. What Pressure Produces This Flow Rate? where is the pressure at the entrance of the needle and is the pressure in the vein. The only unknown is . where, in this case, is the pressure at the water works and is the resistance of the water main. During times of heavy use, the flow rate is large. This means that must also be large. Thus must decrease. It is correct to think of flow and resistance as causing the pressure to drop from to . is valid for both laminar and turbulent flows. created at the water works. If the flow is very small, then the pressure drop is negligible, and . We can use to analyze pressure drops occurring in more complex systems in which the tube radius is not the same everywhere. Resistance will be much greater in narrow places, such as an obstructed coronary artery. For a given flow rate , the pressure drop will be greatest where the tube is most narrow. This is how water faucets control flow. Additionally, is greatly increased by turbulence, and a constriction that creates turbulence greatly reduces the pressure downstream. Plaque in an artery reduces pressure and hence flow, both by its resistance and by the turbulence it creates. [link] is a schematic of the human circulatory system, showing average blood pressures in its major parts for an adult at rest. Pressure created by the heart’s two pumps, the right and left ventricles, is reduced by the resistance of the blood vessels as the blood flows through them. The left ventricle increases arterial blood pressure that drives the flow of blood through all parts of the body except the lungs. 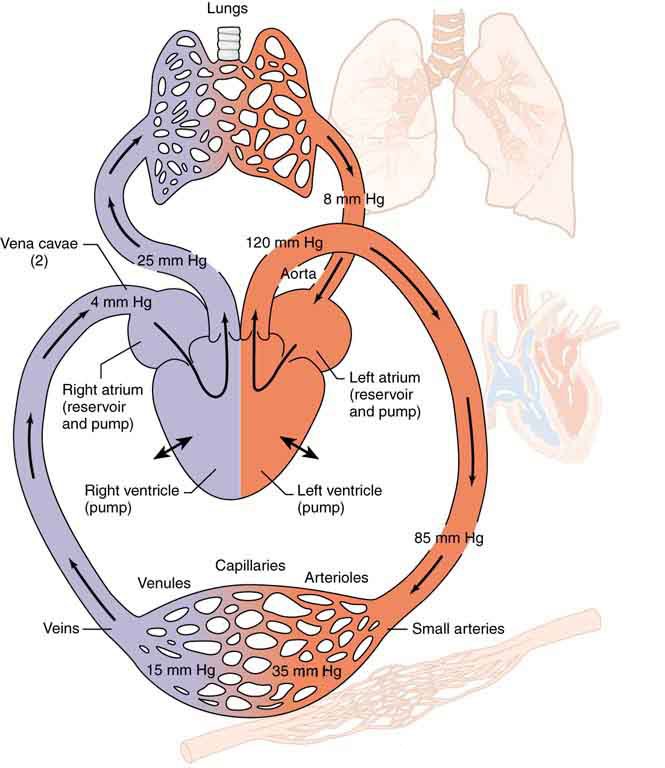 The right ventricle receives the lower pressure blood from two major veins and pumps it through the lungs for gas exchange with atmospheric gases – the disposal of carbon dioxide from the blood and the replenishment of oxygen. Only one major organ is shown schematically, with typical branching of arteries to ever smaller vessels, the smallest of which are the capillaries, and rejoining of small veins into larger ones. Similar branching takes place in a variety of organs in the body, and the circulatory system has considerable flexibility in flow regulation to these organs by the dilation and constriction of the arteries leading to them and the capillaries within them. The sensitivity of flow to tube radius makes this flexibility possible over a large range of flow rates. Schematic of the circulatory system. Pressure difference is created by the two pumps in the heart and is reduced by resistance in the vessels. Branching of vessels into capillaries allows blood to reach individual cells and exchange substances, such as oxygen and waste products, with them. The system has an impressive ability to regulate flow to individual organs, accomplished largely by varying vessel diameters. and increases through branching, the average velocity of the blood in the smaller vessels is reduced. The blood velocity in the aorta ( ) is about 25 cm/s, while in the capillaries ( in diameter) the velocity is about 1 mm/s. This reduced velocity allows the blood to exchange substances with the cells in the capillaries and alveoli in particular. Fluid viscosity is due to friction within a fluid. Representative values are given in [link]. Viscosity has units of or . Explain why the viscosity of a liquid decreases with temperature—that is, how might increased temperature reduce the effects of cohesive forces in a liquid? Also explain why the viscosity of a gas increases with temperature—that is, how does increased gas temperature create more collisions between atoms and molecules? When paddling a canoe upstream, it is wisest to travel as near to the shore as possible. When canoeing downstream, it may be best to stay near the middle. Explain why. Why does flow decrease in your shower when someone flushes the toilet? 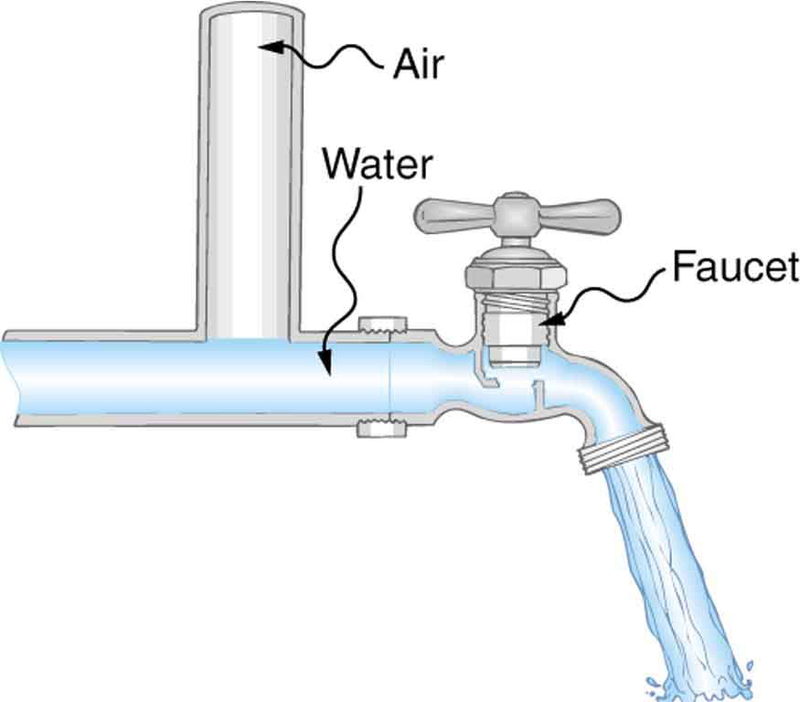 Plumbing usually includes air-filled tubes near water faucets, as shown in [link]. Explain why they are needed and how they work. The vertical tube near the water tap remains full of air and serves a useful purpose. (a) Calculate the retarding force due to the viscosity of the air layer between a cart and a level air track given the following information—air temperature is , the cart is moving at 0.400 m/s, its surface area is , and the thickness of the air layer is . (b) What is the ratio of this force to the weight of the 0.300-kg cart? What force is needed to pull one microscope slide over another at a speed of 1.00 cm/s, if there is a 0.500-mm-thick layer of water between them and the contact area is ? A glucose solution being administered with an IV has a flow rate of . What will the new flow rate be if the glucose is replaced by whole blood having the same density but a viscosity 2.50 times that of the glucose? All other factors remain constant. The pressure drop along a length of artery is 100 Pa, the radius is 10 mm, and the flow is laminar. The average speed of the blood is 15 mm/s. (a) What is the net force on the blood in this section of artery? (b) What is the power expended maintaining the flow? Fluid originally flows through a tube at a rate of . To illustrate the sensitivity of flow rate to various factors, calculate the new flow rate for the following changes with all other factors remaining the same as in the original conditions. (a) Pressure difference increases by a factor of 1.50. (b) A new fluid with 3.00 times greater viscosity is substituted. (c) The tube is replaced by one having 4.00 times the length. (d) Another tube is used with a radius 0.100 times the original. (e) Yet another tube is substituted with a radius 0.100 times the original and half the length, and the pressure difference is increased by a factor of 1.50. Angioplasty is a technique in which arteries partially blocked with plaque are dilated to increase blood flow. By what factor must the radius of an artery be increased in order to increase blood flow by a factor of 10? (a) Suppose a blood vessel’s radius is decreased to 90.0% of its original value by plaque deposits and the body compensates by increasing the pressure difference along the vessel to keep the flow rate constant. By what factor must the pressure difference increase? (b) If turbulence is created by the obstruction, what additional effect would it have on the flow rate? Using the equation of the previous problem, find the viscosity of motor oil in which a steel ball of radius 0.8 mm falls with a terminal speed of 4.32 cm/s. The densities of the ball and the oil are 7.86 and 0.88 g/mL, respectively. A skydiver will reach a terminal velocity when the air drag equals their weight. For a skydiver with high speed and a large body, turbulence is a factor. The drag force then is approximately proportional to the square of the velocity. Taking the drag force to be and setting this equal to the person’s weight, find the terminal speed for a person falling “spread eagle.” Find both a formula and a number for , with assumptions as to size. A layer of oil 1.50 mm thick is placed between two microscope slides. Researchers find that a force of is required to glide one over the other at a speed of 1.00 cm/s when their contact area is . What is the oil’s viscosity? What type of oil might it be? (a) Verify that a 19.0% decrease in laminar flow through a tube is caused by a 5.00% decrease in radius, assuming that all other factors remain constant, as stated in the text. (b) What increase in flow is obtained from a 5.00% increase in radius, again assuming all other factors remain constant? When physicians diagnose arterial blockages, they quote the reduction in flow rate. If the flow rate in an artery has been reduced to 10.0% of its normal value by a blood clot and the average pressure difference has increased by 20.0%, by what factor has the clot reduced the radius of the artery? During a marathon race, a runner’s blood flow increases to 10.0 times her resting rate. Her blood’s viscosity has dropped to 95.0% of its normal value, and the blood pressure difference across the circulatory system has increased by 50.0%. By what factor has the average radii of her blood vessels increased? 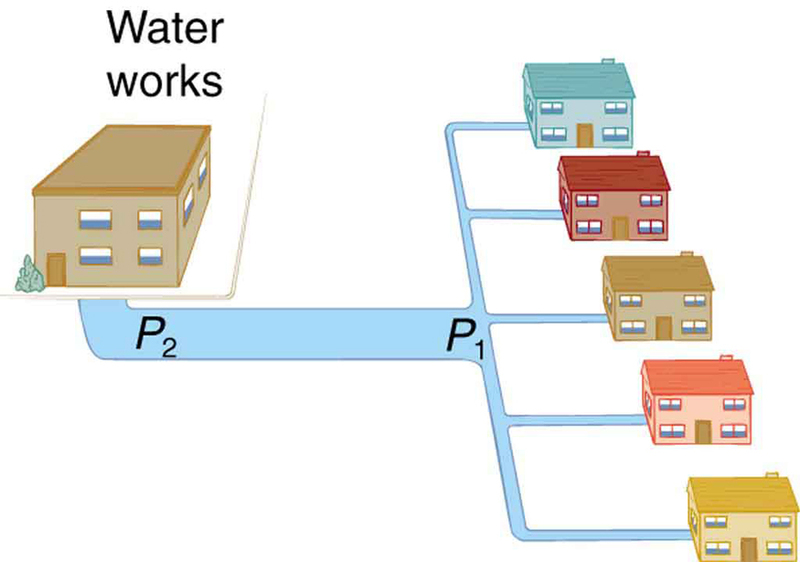 Water supplied to a house by a water main has a pressure of early on a summer day when neighborhood use is low. This pressure produces a flow of 20.0 L/min through a garden hose. Later in the day, pressure at the exit of the water main and entrance to the house drops, and a flow of only 8.00 L/min is obtained through the same hose. (a) What pressure is now being supplied to the house, assuming resistance is constant? (b) By what factor did the flow rate in the water main increase in order to cause this decrease in delivered pressure? The pressure at the entrance of the water main is , and the original flow rate was 200 L/min. (c) How many more users are there, assuming each would consume 20.0 L/min in the morning? 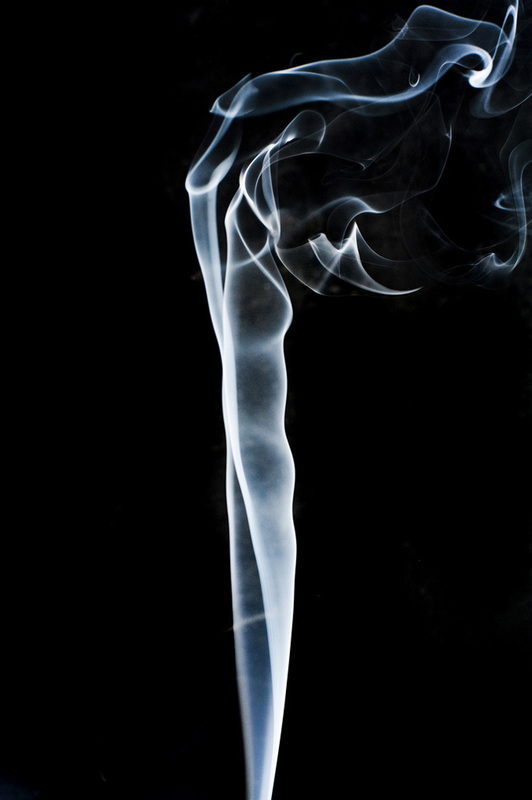 An oil gusher shoots crude oil 25.0 m into the air through a pipe with a 0.100-m diameter. Neglecting air resistance but not the resistance of the pipe, and assuming laminar flow, calculate the gauge pressure at the entrance of the 50.0-m-long vertical pipe. Take the density of the oil to be and its viscosity to be (or ). Note that you must take into account the pressure due to the 50.0-m column of oil in the pipe. Concrete is pumped from a cement mixer to the place it is being laid, instead of being carried in wheelbarrows. The flow rate is 200.0 L/min through a 50.0-m-long, 8.00-cm-diameter hose, and the pressure at the pump is . (a) Calculate the resistance of the hose. (b) What is the viscosity of the concrete, assuming the flow is laminar? (c) How much power is being supplied, assuming the point of use is at the same level as the pump? You may neglect the power supplied to increase the concrete’s velocity. Consider a river that spreads out in a delta region on its way to the sea. Construct a problem in which you calculate the average speed at which water moves in the delta region, based on the speed at which it was moving up river. Among the things to consider are the size and flow rate of the river before it spreads out and its size once it has spread out. You can construct the problem for the river spreading out into one large river or into multiple smaller rivers. Viscosity and Laminar Flow; Poiseuille’s Law by OpenStaxCollege is licensed under a Creative Commons Attribution 4.0 International License, except where otherwise noted.